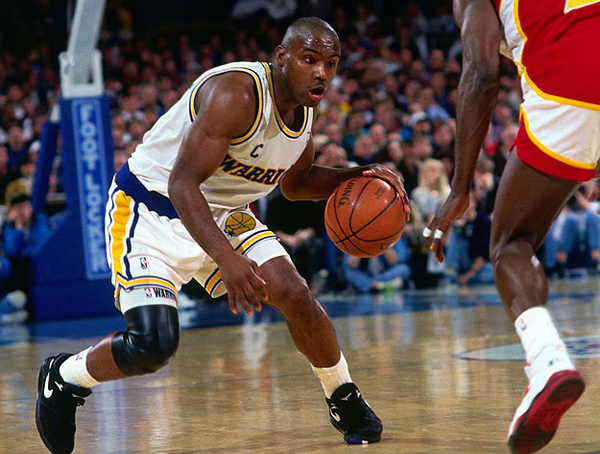 Tim Hardaway was fun player to watch in the NBA. 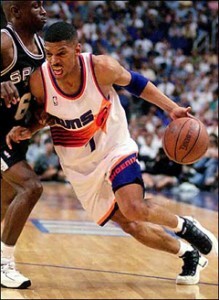 Tim entered into the NBA in 1989 from his college playing days at UTEP. He played for the Golden State Warriors, Miami Heat, Dallas Mavericks, Denver Nuggets, and Indiana Pacers. He was a five time NBA All-Star and had his numbered retired by the Miami Heat. Now Tim gets to watch his son, Tim Jr. follow his footsteps by playing in the NBA. Tim’s son got drafted this year by the New York Knicks. 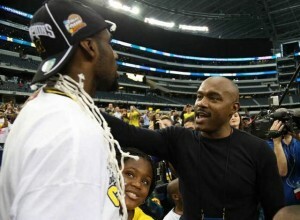 Hardaway also started up the Tim Hardaway Foundation to help kids have a brighter future. I was able to chat with Tim about his playing days in the NBA, fatherhood, and his foundation. Art Eddy: You played in college for UTEP and then was drafted in 1989 by Golden State. What was the toughest transition for you from college to the NBA? Tim Hardaway: I really didn’t have a tough transition from college to the NBA because I had the best of both worlds. Every time that I went home during the summer I would play against NBA All-Stars. Michael Jordan, Craig Hodges, Mo Cheeks, Isiah Thomas, Doc Rivers, Terry Cummings, overseas guys, so I had the best of both worlds. I had a whole bunch of guys that taught me about how to play the game of basketball. I was fortunate to have them to come back to Chicago and play in all the Pro-Am tournaments around the Chicago area. That’s how I became confident. That’s how I became real tough. So my transition from college to the NBA wasn’t that difficult. Plus, I went four years in college so that was great. 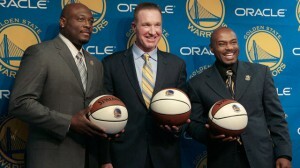 AE: I loved the nickname “Run TMC” given to you and the two other Golden State greats Mitch Richmond and Chris Mullin. How quick was it to build chemistry with those guys? TH: It was great. You had (Mitch) Rookie of the Year the year I was coming in. You got an established ball player, a two time Big East Player of the Year in Chris Mullin. You had great guys on the team like Rod Higgins, Tom Tolbert, Jim Peterson, Alton Lister, Sarunas Marciulionis. You had a great Hall of Fame coach in Don Nelson. Had some great assistant coaches. The organization was great. I couldn’t have thought about coming into a better situation for myself. It was an easy transition for me because I had people that cared about young people and guys who were veterans. AE: You were known for your killer crossover move that would break ankles. When in your career did you master that and did it become your go to move? TH: It wasn’t my go to move. I just did it. I just came down the court and did it. It wasn’t like I was going to do the move on this guy. I just came down the court and did a series of moves. If it was a crossover, it was a crossover. If was me in an in and out move coming off a pick and roll, I was going to pick and roll. I just worked on my game to perfection to do all those things the correct way. I would try and get me and my teammates open for a better shot. I worked hard on my game to get it to where it was real good. AE: You reached 5,000 points and 2,500 assists faster than any other NBA player, except Oscar Robertson. What did that milestone mean to you? To me that is an amazing stat. I had great guys on my team that loved to play and I loved giving the ball to them. It was an accolade that I never knew nothing about. You always have to get accolades. It was nice then, but I always wanted more. AE: Who gave you the biggest headache on the court? TH: Oh man, Kevin Johnson. Rod Strickland, Gary Payton, John Stockton. Each and every night you had a game to play. You had Magic Johnson and Byron Scott and Coop (Michael Cooper). Every game was tough. I guess to answer your question the guys that I liked and loved going against were Kevin Johnson was one, John Stockton was two, and Gary Payton was three. It was tough day in and day out on the west coast. AE: As a father you get to watch your son, Tim Jr., play in the NBA. He just recently got drafted by the New York Knicks. What advice did you give him about playing in the NBA? TH: I think that he already understands. He is very humble. He is like a sponge. He wants to learn. He doesn’t like losing. He is a competitor. He has heart. He has confidence, all you want in a basketball player. He is going to a team that is trying to get their image to be well liked around the NBA. I think that they have done that. They brought in some key pieces. I think fans around the NBA like what they are doing. He will be a consummate pro. He is going out there and learn and be taught and just like a sponge he is going to absorb everything. AE: Also he and his fellow teammates at Michigan had a heartbreaking loss in this year’s NCAA tournament. What did you tell him after the game? TH: It was hard to try and tell him anything. I think that he understood the situation. I think the coach handled it in great fashion. They exceeded all expectations. If it wasn’t for Behanan getting three or four offensive rebounds they could have won. They took it as well as I expected. I didn’t have to say nothing. When I asked him, ‘How are you doing?’ He said, ‘It hurts, but I am fine.’ That was the extent of our conversation. That was if for that. As long as he said he was fine. You got to let your kids, like I was brought up, you got to let them get through the bumps and bruises. The good and the bad and the heartbreaks of the game. They did that all season long. It is going to prepare him for the next challenge in his life in the NBA. AE: Tell me about the great work you do with your foundation. TH: The Tim Hardaway Leadership Academy is about reaching out to the kids and preparing them for life. Making sure that we care about them. Making sure that they understand to respect themselves. Go to school and get their education. Respect their parents. Respect the teachers that are teaching them. My grandmother always quoted Martin Luther King, ‘Be somebody.’ Make your parents proud. We are going to help you out with tutoring. We are going to help you out with counseling. We are all here to build a village. It is just not one person to build a village. Everybody has to come out and build a village. That is what we try and do. We are out here as a team and helping each other and working with each other to strive for better in the world. That is what the Tim Hardaway Leadership Academy is all about. AE: What motivated you to start that up? TH: People gave back to me. I wouldn’t be here today if people didn’t give back to me. They opened up their eyes and helped me out to keep me off the streets of Chicago. They cared about me to point me in the right direction. You don’t need to go there. You need to go this way. I had parents too. A lot of kids don’t have both of their parents. I was lucky. I had both of my parents. Even though my parents were divorced, my dad used to live right down the street. My mom would him and say the boys are acting up. He would be there Johnny on the spot with his belt ready to discipline us. I wish more kids had both of their parents, their moms and their dads especially their dads. No matter if you are a girl or a boy. You definitely need your dad in your life. People gave back to me. I want to give back to them to help these kids out. These kids are our future. I am on my kids every day. Talking to them and making them understand saying, ‘No that wasn’t right.’ You got to have them accountable for what they do. If they aren’t accountable for what they do than they can go anywhere and do anything that they are not supposed to do. So that is why I am here and I am doing it. Print article This entry was posted by Art Eddy III on July 24, 2013 at 8:30 pm, and is filed under Sports. Follow any responses to this post through RSS 2.0. Both comments and pings are currently closed.